20 years of experience with NSV HMG have revealed some disadvantages of the system, e.g. the dispersion of the HMG no longer satisfied the military. This, together with the need to switch to the local production base (NSVT being produced in Kazakhstan), gave birth to the new 12.7 HMG, called Kord. This machine-gun was developed in Kovrovo by A.A.Namitulin, N.M.Obidin, Ju.M.Bogdanov and V.I.Zhirokhin. 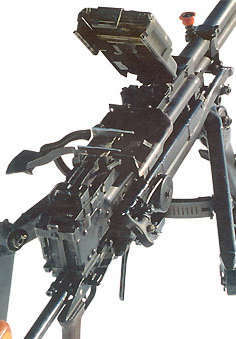 The differences include sliding breech-block instead of a wedge, belt-feed from both sides, efficient muzzle break/flame suppressor, and a new barrel design that provides for even barrel heating during firing resulting in 1.5-2 times dispersion reduction, as well as simpified barrel replacement. According to estimates, Kord gunner will need on average 20 rounds to hit a running man at 1000 m, 5 to hit a vehicle, and he will need just 13 rounds to reliably immobilize an APC at 2000 m.
This machine-gun is being produced by Degtyaryov plant (ZID). This page is © 2000-2007, Vasiliy Fofanov.